10 things that raise blood pressure. What factors can raise your blood pressure? There’s no way of telling from the outside if you have high blood pressure. You can feel perfectly well and yet the force of blood pressing against the walls of your arteries can be high enough to be slowly causing damage that increases your risk of heart disease, strokes and kidney failure. That’s why you’re encouraged to get your doctor to regularly check your blood pressure at age 45 (or earlier if you have other risk factors like diabetes, smoking, overweight or a family history of early heart disease or kidney disease). After the initial check, it’s a good idea to get your GP to take your blood pressure every year. To imagine the strain this puts on your heart, think of the pressure you need when you blow up a round balloon compared to how much you need to blow up one of those long skinny balloons used to make balloon animals. Experts point to traditional populations, such as indigenous people in Brazil, where there is no significant rise in blood pressure with age. This suggests our Western lifestyle, particularly salt intake, is the major factor. You are at higher risk of having high blood pressure if you have a close relative with it. But genetics may only be responsible for about one third of the cases of high blood pressure. In some families the effect is strong, while for others both parents could have high blood pressure but the offspring are spared. It’s also worth noting, families don’t just share genes. There are often shared lifestyle habits that may contribute to high blood pressure. This adds to the risk of developing high blood pressure and older people are more vulnerable. Smoking markedly increases the risk of heart disease or stroke for a given level of high blood pressure compared to a non-smoker. Regular alcohol intake is clearly associated with high blood pressure. It seems to have an especially marked effect on the blood pressure of older women who smoke. Regular heavy or binge drinking can also cause substantial rises in blood pressure, sometimes extreme enough to lead to a stroke. Alcohol can also impact the effectiveness of blood pressure-lowering medication. Obesity increases the risk of developing high blood pressure in the next four years by 6 per cent. Extra body fat around your middle carries the greatest risk. People who spend a lot of time watching TV and little time on physical activity have been shown to have 3-4 mmHg higher blood pressure than more active people. Inflammation and infection (among other things) can cause kidney disease, which is a major cause of high blood pressure. Once you have high blood pressure, it can make kidney disease worse. Someone with normal kidney function who is in the early stages of high blood pressure is likely to develop kidney disease in the next six years if they don’t receive blood pressure treatment. Sodium chloride is the main source of sodium in most foods — it’s also the chemical name for ordinary salt. As sodium in our blood increases, the blood vessels retain water to try to balance the sodium concentration. This extra water increases the volume of blood in vessels, causing high blood pressure. The recommended maximum salt intake is less than six grams a day, but most Australians eat more than this. Reducing the salt you add to your food makes only a limited difference as 75 per cent of the salt we eat is hidden in processed foods (often the ones we don’t think are bad for us, such as bread and breakfast cereals). Some takeaway pizzas contain 13 grams per single pizza. Bread alone contributes 20 per cent of dietary salt intake and processed meats 15 per cent. Condiments, sauces and marinades we add to food are often very high in salt. About 5 per cent of people with high blood pressure have a specific underlying cause, generally related to their kidneys, their aorta (the major artery which takes blood away from the heart) or hormonal conditions. 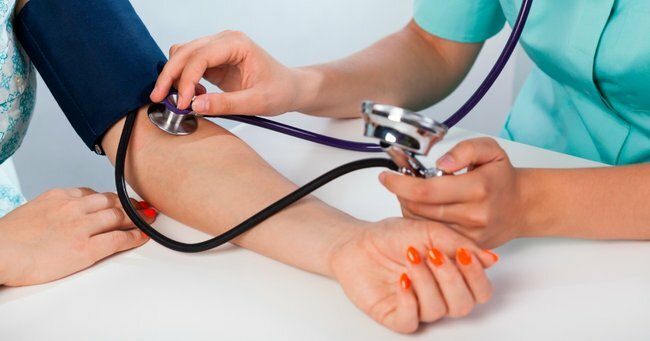 Unlike the most common forms of high blood pressure, which generally require lifelong treatment, many of these rare causes of high blood pressure are curable.